In a large serving bowl or mixing bowl, whisk together the olive oil, lemon juice, red wine vinegar, salt, oregano and pepper. 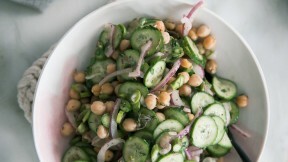 Then add the asparagus, garbanzo beans, cucumbers and red onion. Toss until combined. This is a great “make-ahead” salad so feel free to keep it in the fridge for up to 2 days.